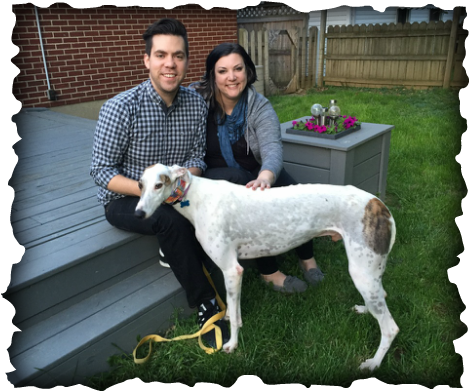 Wish was adopted by John and Sarah (Tigger the cat, not pictured) of Erlanger KY. John and Sarah were looking to adopt a greyhound but when they came and met several greyhounds, they decided they definitely wanted two! John and Sarah are going to spoil Wish but soon will be adding another to their family! Wish walked right in to their house, confident as can be, and didn't have any interest in the car, just wanted to be right next to John & Sarah! This is one lucky (and spoiled) dog!